For the wine industry, harvest is the most important time of year. It’s an exciting time when the air is full of the smell of crushed and fermenting grapes, there is a constant buzz of action on our crush pad and in our lab, and everyone has their eye on the weather and the vineyards to see what grape varietal or vineyard will be ready to pick next. This time of year is intense, somewhat stressful, often sleepless and really fun. Adding to the intensity and busy schedules of our vineyard and winemaking crew is the fact that most of our grapes are harvested in the middle of the night. This makes for a difficult sleep schedule but it is vital to the quality of the grapes we pick and the wine we make it into. Bringing in the grapes at night when they are cool allows for better acid, sugar levels and aromatics. It also has the added benefit of being a much more pleasant time to pick grapes, which is better for our crew who might otherwise suffer from fatigue and dehydration. Of course, we have to be able to see the grapes we are picking. That’s why we bring in large lighting mechanisms that can be attached to the tractors pulling the grape bins. These large lights create conditions where grapes and bins can be easily spotted, and the vests of workers light up so tractor drivers can see them. Night harvesting can border on being chaotic, and we have to make sure every member of our crew is safe. One such pick took place on Monday night at our Sunny Slope Vineyard on Highway 12, just a couple miles from our Sonoma Mountain estate. We had determined that the Merlot grapes had good sugar levels and were ready to be picked. Luckily, it was a perfect evening as it was a Harvest Super Moon. What’s that, you ask? The harvest moon is the full moon that lands closest during the year to the Northern Hemisphere’s autumnal equinox on September 22nd. It was called this because it lights up the night, allowing farmers more hours to gather up their crop. It also happened to be a Supermoon which is when a full moon makes it’s closest approach to earth on it’s elliptical orbit. These two events don’t always collide, but it made for a spectacular night and an auspicious one if you ask us. Starting around 9 p.m. and lasting throughout the night, our Vineyard Managers supervised the pick, counting bins and making sure no rows were left unpicked. The vineyard crew quickly picked and dumped their grapes into the bins. Many Benziger family members and numerous long-term staff of the company were in attendance, picking grape leaves out of the bins, helping to supervise the pick and operating the forklifts and flat-bed trucks needed to bring all those grapes back to the winery for crush. 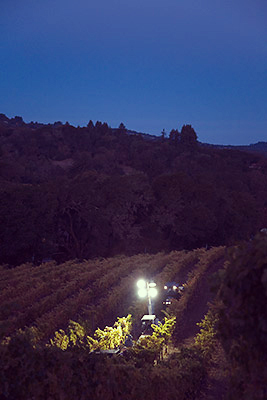 Watch the below video for a close-up look at night harvest on our Sunny Slope Vineyard. And if you happen to take an evening drive around wine county in the next few weeks and see large flood lights in the vineyard, you’ll know there are some hard-working crews out there working tirelessly to bring you your next favorite wine. Cheers! Tagged benziger, family winery, harvest, merlot, sonoma county, sonoma wine, sunny slope, vineyards, wineBookmark the permalink. Thank you Terri! We were very fortunate to have sustained VERY minimal damage from the earthquake.